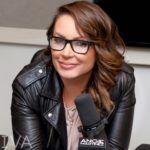 Angie Martinez is an American radio personality, rapper, and actress. Nicknamed “The Voice of New York”, her afternoon radio show has consistently been ranked #1 with more young listeners than any other radio program in the country. "I had a lot of respect for Biggie, and it was just a weird, kinda difficult thing. When I’m doing touchy interviews like that, I just try to be fair to both parties." "The people I chose to work with me on this album are there because I have a personal relationship with them."